Due to limited capture volume, a part of the trial was carried out using a treadmill. The difference between compulsive speed and natural walking limits the study. To eliminate this limitation, a few steps of ground walks were also recorded in each test case. The motion was assessed using distance type and angular gait parameters (step width, step height, step length, stride length, spinal and limbic joint angles). 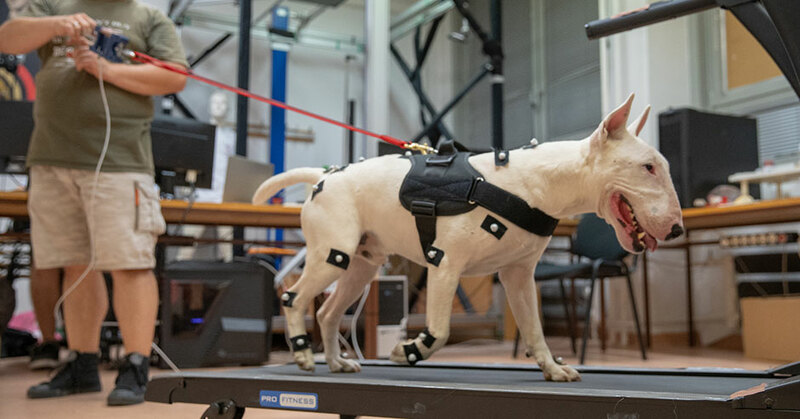 The study involved five dogs previously trained for treadmill walking. Test cases were defined for every combination of the following factors: with different harnesses and without harness, with and without leash, treadmill and ground walk. Gait parameters were calculated from the 3D coordinates of anatomical points, recorded by an optical motion capture system. The walking kinematics of the dogs significantly differed between treadmill walk and ground walk. Probably, the reason for this is the switch between different movement types (walk and trot) between the forced speed on the treadmill and self-selected speed on the ground. The usage of different harnesses compared to gait without harness does not influence gait kinematics as none of the studied gait parameters indicated significant deviations. In case of retracted leashes, the changes in gait kinematics is similar for each harness. Due to the pull of the leash the dog changes to a slower gait pattern (from trot to walk) on the ground. On the treadmill at unchanged constrained walking speed, the pull of the leash does not alter significantly the gait pattern in any of the studied harnesses. Consequently, the wearing of the different harnesses – either without leash or with retracted leash – does not influence the dog’s walking kinematics; only the changes of willingly chosen natural walking patterns at different speeds (walk, trot) influence gait kinematics, but this is a trained behavior of dogs in response to the retraction force expressed by their owner.